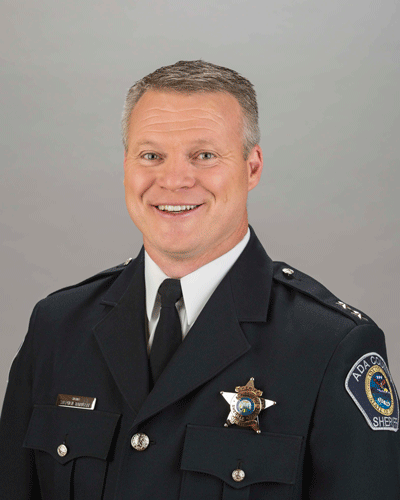 Stephen Bartlett joined the Ada County Sheriff’s Office in Boise, Idaho, in 2003 and advanced through the ranks until he was appointed Ada County Sheriff in 2015. Sheriff Bartlett is responsible for the largest law enforcement agency in the State of Idaho with over 740 employees and an over $60 million budget. His duties include policing unincorporated Ada County and the cities of Eagle, Kuna and Star. He is also responsible for managing the 1,224-bed Ada County Jail — and community supervision of about 3,500 offenders. Sheriff Bartlett is also responsible for Ada County Misdemeanor Probation, runs the county-wide 911 Emergency Dispatch Center and fulfills a variety of other statutory and cooperative duties. Sheriff Bartlett is known for his collaboration skills and working closely with other law enforcement agencies and community partners to solve problems. Sheriff Bartlett has a bachelor’s degree in social sciences. He wanted a richer understanding of what made people behave and act in certain ways, figuring it would make him a better law enforcement officer. Bartlett joined the Payette County Sheriff’s Office after moving to Idaho in the mid 90s. He then moved on to the Garden City Police Department for a few years before joining the ACSO in 2003. During his two decades in law enforcement, Sheriff Bartlett has worked as a 911 dispatcher, jail deputy, patrol deputy, detective, K9 handler, polygrapher, crisis negotiator, patrol sergeant, jail sergeant, lieutenant, Chief of Eagle Police, and administrative captain. When former Sheriff Gary Raney decided to retire in 2015 — before his term was up — he totally supported the appointment of Bartlett to be the next sheriff of Ada County. Bartlett, who became Ada County’s 38th sheriff in June 2015, is now concentrating on the steering the ship that is the ACSO — and he couldn’t be happier. “We value integrity, service, dedication and attitude. We make Ada County a safer place to live, work and play. I believe the culture of our agency is an intentional choice — one that must be nurtured. I want to create a culture of engaged employees who feel valued, want to make a difference and have a passion for what they do. I vow to listen. Steve Bartlett and his family live in Meridian.